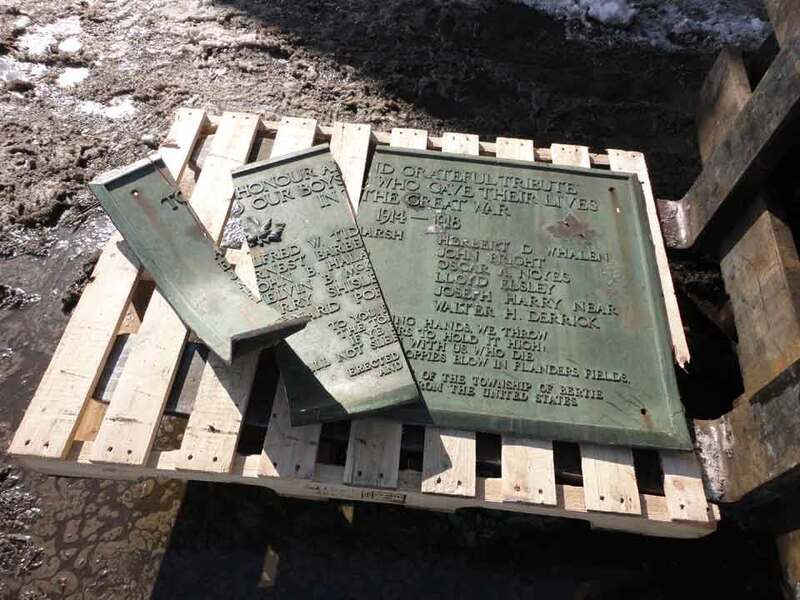 UPDATE (March 3) — Shortly after it had been stolen, the the First World War memorial from Ridgeway Public School showed up at a local recycling operation. The 120-pound bronze plaque had been taken from the “Memorial Rock” at the front of the school on the Family Day weekend, sawn into three pieces and taken to Attar Metals in Fort Erie who refused to purchase it and notified the Town. The plaque was left at the recycler. James Fidler, 37, of Fort Erie was charged March 3 with possession of property obtained by crime under $5000. He was released on a promise to appear order with a future court date. Principal Sherry Storrey-Perchaluk said the discovery was made first thing Tuesday morning when the caretaker made his rounds. She doesn’t know yet what will happen next. Braun has offered to repair the three-foot wide plaque, she said, but it will still show damage. Braun said the value of the metal, primarily copper mixed with some tin, is around $2 per pound. Storrey-Perchaluk said the NRP officer investigating the matter was expected to update her this week. To you from failing hands we throw the torch; be yours to hold it high. If ye break faith with us who die, we shall not sleep though poppies blow in Flanders fields. By the citizens of the Township of Bertie and their friends from the United States. To some, nothing is sacred. Sure hope it is repaired. My grandfather’s name is on a similar plaque in Port Colborne for his role in the Second World War of which, our family is quite proud. Such desecration for such petty and short sighted reasons is intolerable. I hope that those involved who can be proven guilty are prosecuted to the fullest extent of the law. Friggin scum. Hang these goofs from a tree. Sad! Perhaps this will help to call attention to some public monuments that are over looked or neglected. As despicable an act as it was to steal this plaque, perhaps they figured that since nobody seems to care about the beautiful historic building behind the plaque (which is scheduled for demolition like every other historical site in Ridgeway), who would miss the plaque too? Unconscionable. It should be repaired/restored, so that it is still the original item….and the lowlifes that caused the damage should be made to pay for it, both out-of-pocket and with a criminal record.